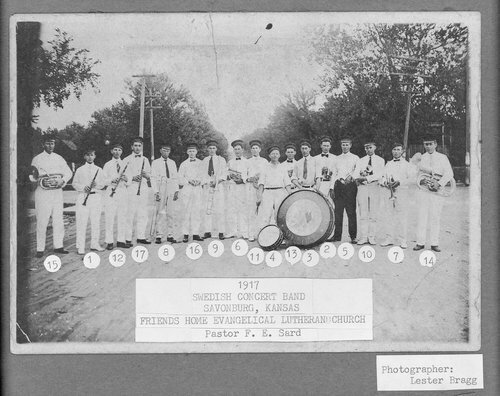 A photograph of the Swedish Concert Band, Friends Home Evangelical Lutheran Church, Savonburg, Kansas. Members of the band are: 1. Carroll M. Barsby, 2. Conrad Erickson, 3. Olaf Gerdin, 4. Evan Holmes, 5. Wilber Johnson, 6. Robert Larson, 7. Harry Lindberg, 8. Julius Lindberg, 9. Joel Nelson, 10. Arthur Nystrom, 11. Carl Oberg, 12. Martin Oberg, 13. Joel Rumblad, 14. Arthur Sellegren, 15. Grover Sellegren, 16. Robert Sellegren, and 17. Arthur Westerberg.